Discover Southern Vermont visits the counties of Windham and Windsor and offers cyclists a tour through some of the smallest and most peaceful villages anywhere. These hamlets are nestled around covered bridges, quiet back roads, river valleys and filled with big hearted Vermonters who enjoy life at a slow pace. In addition to the idyllic cycling, Discover Southern Vermont offers a taste of all the things you associate with The Green Mountain State: Clean, clear rivers, Country General Stores, pure Vermont Maple Syrup, antique shops and an award winning cheese factory. We visit the timeless towns of Woodstock, Chester, Grafton and Plymouth (birthplace of President Calvin Coolidge). You will get a picture of the Vermont that has inspired artisans, poets and statesmen. 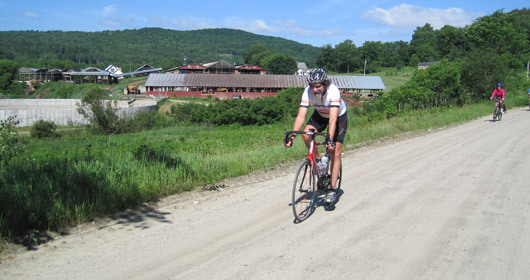 Riding from village to village, you will enjoy some of the most scenic vistas Vermont has to offer. We commence the tour in the relaxed country comfort of the October Country Inn, a restored 19th century farmhouse. Edie and Chuck Janisse, our welcoming and experienced hosts, will make you feel at home while preparing international-themed dishes which will dazzle your palate and fuel your cycling body. The inn's rooms are cozy. The common areas are ample and designed to encourage group activity. River valley riding is Monday’s theme. We begin spinning west along the Ottauquechee River towards the famous ski town of Killington. Mission Farm and River roads will delight with their scenic beauty before you turn north towards the town of Pittsfield along the Tweed River. You might want to take a break to visit the “Original General Store” and sample their fresh baked goods. Next up is the White River Valley, which takes us to our hill du jour. We’ll ascend to the village of Barnard, home to another unique general store that overlooks pristine Silver Lake (perfect for a swim) and known for its locally made ice cream. We finish our day with a long descent into one of the prettiest towns in America, Woodstock. Here you may want to stroll the village green, bike through the Middle Covered Bridge and visit the array of craft shops and galleries. 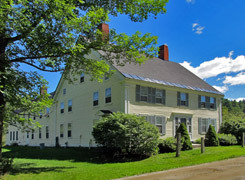 Not far are the Billings Farm Museum and Rockefeller family mansion which are worthwhile stops. An easy ride along the Ottauquechee River takes us back to The October Country Inn for another farm fresh meal. On Tuesday, we pedal south through the Reading Gulf with Mount Ascutney standing guard to our east. You can stop at Stoughton Pond Recreation area and visit The Vermont Soap Stone Company and take a refreshing dip in Stoughton Pond. Next we skirt the old machine shop town of Springfield, which is also the confluence of the Connecticut and Black Rivers. We arrive at The Henry Farm Inn, our home for the next two nights. Patricia and Paul Dexter welcome you to their lovely 200+ year old inn, situated on 55 acres of rolling meadow and forested farmland. The spring fed swimming pond is ideal for a cool dip after a hot day in the saddle. 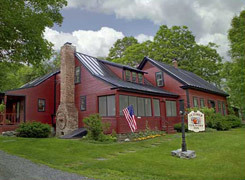 The inn was originally a stagecoach stop on the Green Mountain Turnpike as well as Chester's first tavern. Today it is a peaceful inn, off the beaten path, and perfectly situated to access southern Vermont's best cycling. On Wednesday morning we wind our way south to three noteworthy towns and villages: Saxtons River, Grafton and Chester. We'll start our ride through Pleasant Valley on our way to Saxtons River, a village lost in time. This tiny Vermont hamlet with streets lined with 19th century buildings, has recently been named to the National Register of Historic Places. Our next stop, several miles to the west, is the village of Grafton. Most agree that Grafton is the Vermont they imagined…a quaint general store, statuesque white church, and renowned cheese factory with the quiet rumble of the Saxtons River as background music. After lunch at Daniel's House Café and a visit to the Grafton Cheese Factory (where you may sample their famous cheddar cheese and see how it is made), we head north to our final village of the day, Chester, before returning to The Henry Farm Inn. Thursday we say goodbye to the most southern points of our tour and head north. Once again we enjoy quiet, easy-to-moderate, country roads on our way to Weston and its famous Vermont Country Store. Weston is rich in history and well preserved. You may visit The Museums of Weston, with their fully operational Old Mill and collection of antique tools and machinery. Next up for those looking for a challenge, the optional Terrible Mountain hill climb, which gains 800 feet in 3 miles! For the rest of us, it is a short van shuttle to Ludlow, home to Okemo Ski Resort. Save time for a final stop at the President Calvin Coolidge State Historic Site before finishing the day's ride with a wonderful seven-mile downhill and the conclusion of our tour.